The highlight of this week was the release of LXD 2.20 which introduces a number of exciting new features. LXD 2.20 should now be available everywhere through both native packages and snap. We also started the process of deprecating the various LXD PPAs, see below for details. 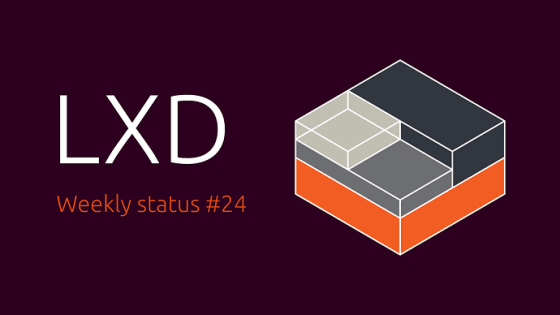 Our next milestone is LXD 2.21 in about a month which will be the last LXD release of the year and the last LXD 2.x release. Once 2.21 is out, we’ll focus on LXD 3.0 with the first alpha expected in January. At the end of this year, we are going to stop delivering LXD through our PPAs. This is done to cut down the amount of time we have to spend on packaging, tooling maintenance and package version tracking when dealing with issues. PPA users have until the end of December to transition over to one of those two, a warning message has been added to the LXD package in our PPAs, including instructions on moving to either the snap or backport package while keeping all your data in place. LXD 2.20-0ubuntu1 was uploaded to Ubuntu 18.04. LXD 2.20-0ubuntu2 was uploaded to Ubuntu 18.04, fixing a build issue. LXD 2.20-0ubuntu3 was uploaded to Ubuntu 18.04, fixing a test failure. This was then automatically picked up by our PPAs. LXD 2.20-0ubuntu4 was uploaded to Ubuntu 18.04, cherry-picking a couple of bugfixes. This was then automatically picked up by our PPAs and manually tested and uploaded to Ubuntu 16.04, 17.04 and 17.10 through backports. Updated the stable channel to LXD 2.20.